During your travels of The Alola Region, as like the previous Generation of Pokemon, you will discover and obtain what are known as Mega Stones. With these given items, you can Mega Evolve certain Pokemon. Each Mega Stone is for a specific Pokemon, and almost all of them can be purchased from The Battle Tree after Dexio helps you begin using them. Abomasite: One of a variety of mysterious Mega Stones. Have Abomasnow hold it, and this stone will enable it to Mega Evolve during battle. Absolite: One of a variety of mysterious Mega Stones. Have Absol hold it, and this stone will enable it to Mega Evolve during battle. Aerodactylite: One of a variety of mysterious Mega Stones. Have Aerodactyl hold it, and this stone will enable it to Mega Evolve during battle. Aggronite: One of a variety of mysterious Mega Stones. Have Aggron hold it, and this stone will enable it to Mega Evolve during battle. Alakazite: One of a variety of mysterious Mega Stones. Have Alakazam hold it, and this stone will enable it to Mega Evolve during battle. Altarianite: One of a variety of mysterious Mega Stones. Have Altaria hold it, and this stone will enable it to Mega Evolve during battle. Ampharosite: One of a variety of mysterious Mega Stones. Have Ampharos hold it, and this stone will enable it to Mega Evolve during battle. Audinite: One of a variety of mysterious Mega Stones. Have Audino hold it, and this stone will enable it to Mega Evolve during battle. Banettite: One of a variety of mysterious Mega Stones. Have Banette hold it, and this stone will enable it to Mega Evolve during battle. Beedrillite: One of a variety of mysterious Mega Stones. Have Beedrill hold it, and this stone will enable it to Mega Evolve during battle. Blastoisinite: One of a variety of mysterious Mega Stones. Have Blastoise hold it, and this stone will enable it to Mega Evolve during battle. Blazikenite: One of a variety of mysterious Mega Stones. Have Blaziken hold it, and this stone will enable it to Mega Evolve during battle. Cameruptite: One of a variety of mysterious Mega Stones. Have Camerupt hold it, and this stone will enable it to Mega Evolve during battle. Charizardite X: One of a variety of mysterious Mega Stones. Have Charizard hold it, and this stone will enable it to Mega Evolve during battle. Charizardite Y: One of a variety of mysterious Mega Stones. Have Charizard hold it, and this stone will enable it to Mega Evolve during battle. Locations: Battle Tree Diancite: One of a variety of mysterious Mega Stones. Have Diancie hold it, and this stone will enable it to Mega Evolve during battle. Galladite: One of a variety of mysterious Mega Stones. Have Gallade hold it, and this stone will enable it to Mega Evolve during battle. Garchompite: One of a variety of mysterious Mega Stones. Have Garchomp hold it, and this stone will enable it to Mega Evolve during battle. 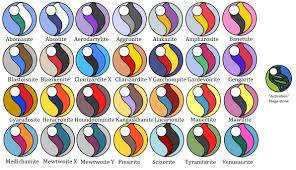 Gardevoirite: One of a variety of mysterious Mega Stones. Have Gardevoir hold it, and this stone will enable it to Mega Evolve during battle. Gengarite: One of a variety of mysterious Mega Stones. Have Gengar hold it, and this stone will enable it to Mega Evolve during battle. Glalitite: One of a variety of mysterious Mega Stones. Have Glalie hold it, and this stone will enable it to Mega Evolve during battle. Gyaradosite: One of a variety of mysterious Mega Stones. Have Gyarados hold it, and this stone will enable it to Mega Evolve during battle. Heracronite: One of a variety of mysterious Mega Stones. Have Heracross hold it, and this stone will enable it to Mega Evolve during battle. Houndoominite: One of a variety of mysterious Mega Stones. Have Houndoom hold it, and this stone will enable it to Mega Evolve during battle. Kangaskhanite: One of a variety of mysterious Mega Stones. Have Kangaskhan hold it, and this stone will enable it to Mega Evolve during battle. Latiasite: One of a variety of mysterious Mega Stones. Have Latias hold it, and this stone will enable it to Mega Evolve during battle. Latiosite: One of a variety of mysterious Mega Stones. Have Latios hold it, and this stone will enable it to Mega Evolve during battle. Lopunnite: One of a variety of mysterious Mega Stones. Have Lopunny hold it, and this stone will enable it to Mega Evolve during battle. Lucarionite: One of a variety of mysterious Mega Stones. Have Lucario hold it, and this stone will enable it to Mega Evolve during battle. Manectite: One of a variety of mysterious Mega Stones. Have Manectric hold it, and this stone will enable it to Mega Evolve during battle. Mawilite: One of a variety of mysterious Mega Stones. Have Mawile hold it, and this stone will enable it to Mega Evolve during battle. Locations: Battle Tree Medichamite: One of a variety of mysterious Mega Stones. Have Medicham hold it, and this stone will enable it to Mega Evolve during battle. Metagrossite: One of a variety of mysterious Mega Stones. Have Metagross hold it, and this stone will enable it to Mega Evolve during battle. Mewtwonite X: One of a variety of mysterious Mega Stones. Have Mewtwo hold it, and this stone will enable it to Mega Evolve during battle. Mewtwonite Y: One of a variety of mysterious Mega Stones. Have Mewtwo hold it, and this stone will enable it to Mega Evolve during battle. Pidgeotite: One of a variety of mysterious Mega Stones. Have Pidgeot hold it, and this stone will enable it to Mega Evolve during battle. Pinsirite: One of a variety of mysterious Mega Stones. Have Pinsir hold it, and this stone will enable it to Mega Evolve during battle. Sablenite: One of a variety of mysterious Mega Stones. Have Sableye hold it, and this stone will enable it to Mega Evolve during battle. Salamencite: One of a variety of mysterious Mega Stones. Have Salamence hold it, and this stone will enable it to Mega Evolve during battle. Sceptilite: One of a variety of mysterious Mega Stones. Have Sceptile hold it, and this stone will enable it to Mega Evolve during battle. Scizorite: One of a variety of mysterious Mega Stones. Have Scizor hold it, and this stone will enable it to Mega Evolve during battle. Sharpedonite: One of a variety of mysterious Mega Stones. Have Sharpedo hold it, and this stone will enable it to Mega Evolve during battle. Slowbronite: One of a variety of mysterious Mega Stones. Have Slowbro hold it, and this stone will enable it to Mega Evolve during battle. Steelixite: One of a variety of mysterious Mega Stones. Have Steelix hold it, and this stone will enable it to Mega Evolve during battle. Swampertite: One of a variety of mysterious Mega Stones. Have Swampert hold it, and this stone will enable it to Mega Evolve during battle. Tyranitarite: One of a variety of mysterious Mega Stones. Have Tyranitar hold it, and this stone will enable it to Mega Evolve during battle. Venusaurite: One of a variety of mysterious Mega Stones. Have Venusaur hold it, and this stone will enable it to Mega Evolve during battle.